The MD Jaguars (C.H. 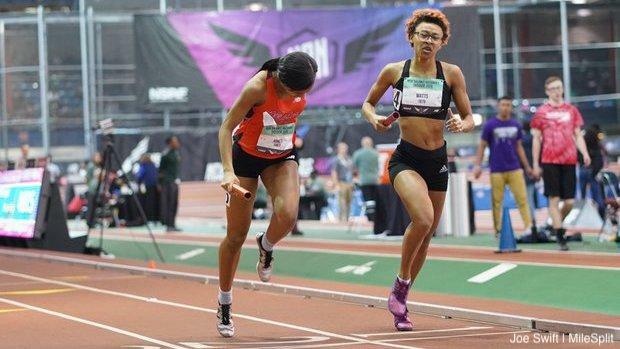 Flowers High School) pulled off the narrowest of victories over Motor City Track Club (Oak Park, MI) in the Emerging Elite Sprint Medley Relay, but both squads went US No. 2 and 3 in the process. The Jaguars ran 4:07.72, edging out Motor City's 4:07.73 mark. Motor City was already US No. 5 and improved over a second in today's race while the Jaguars made a much bigger leap to the top of the national rankings. The Jaguars squad was made up of Indiyah Taylor, Dejah Grant, KeAsya Grier, and Javon Watts. Motor City was represented by Morgan Atlas, Tamyra Todd, Janae Barksdale, and Jayla Jones.